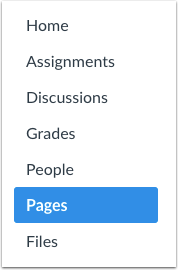 By default, only instructors (teachers) can edit pages. 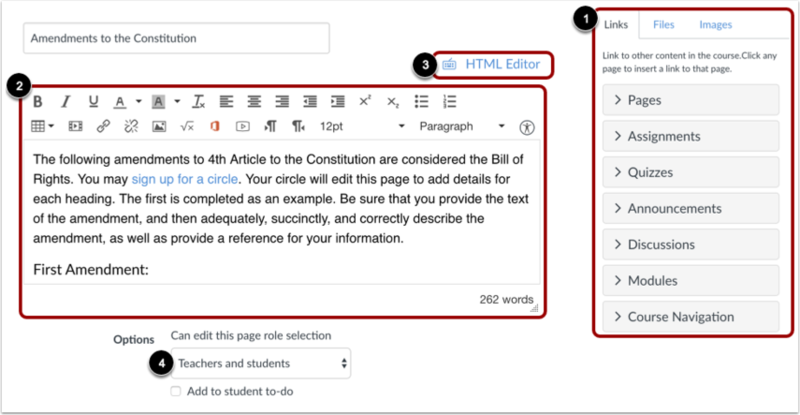 However, you can set a default preference for specific users to edit and contribute to the page in the Course Settings Course Details tab. Add content to your page using the Content Selector . Edit the content and add links and media using the Rich Content Editor  or switch to the HTML Editor . To change the editing permissions for the page, click the Options drop-down menu . View the changes you made to the page. Previous Topic:How do I change the name of a page in a course? Next Topic:How do I duplicate a page in a course? Table of Contents > Pages > How do I edit a page in a course? Re: How do I edit Pages in Canvas? Re: How do you link a course to a textbook?